Released in 2010, Lauren's book Unstoppable In Stilettos has sold over thousand of copies and inspired more globally. How does a girl who was originally predicted to live a wheelchair-bound existence become adventurous, self-assured, successful, and . . . unflappable? 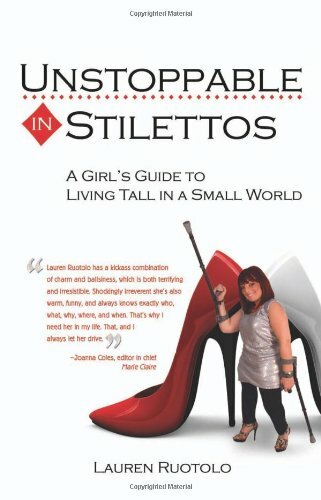 Standing 4 feet 2 inches tall in flats (which she would never be caught dead in, anyway), Lauren Ruotolo has spent her thirty-four-ish years seeing the world from a unique angle―upward facing. Lauren was born with McCune-Albright syndrome, a mysterious and rare genetic disease that researchers say occurs in anywhere between 1 in 100,000 and 1 in 1 million people. Some people with the condition tend to go the wheelchair route, but that was never a road Lauren wanted to travel. Her preferred method of transportation, instead, includes stiletto heels. Lauren has avoided the label of 'disabled' through uniquely discovering who she really is, and now you, too, can learn the secrets to living life in a big way.